This entry was posted in Foodies and tagged blog exchange, link exchange on January 11, 2011 by Yami. sounds nice maybe i’ll check it out! Thanks for posting sis! and I’m also following you now thru GFC. 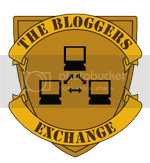 I’m hopping from The Bloggers Exchange, and also following you thru GFC! have a great week ahead:) congrats! Dropped by from the Blogger’s Exchange 🙂 because I’m not a good cook I enjoy trying some of your posted recipes for my family.